I have to confess this has been my first-time, in many things!!! My first time in a translation conference. My first time meeting so many foreign colleagues, in person. My first time seeing facebook come to life. My first time seeing the faces behind the blogs. In many ways, it was an eye-and-mind opening experience. Go off-road if you have to, in order to explore new grounds & possibilities. Then, “sell” and “promote” yourself. Define your boundaries & their elasticity. Stick and defend your plans, your choices, your needs, your dreams. … and customize them, if needed. And, last but not least, Stay calm and Carry-on Translating!!! So, I have to say, that I left Athens with more food-for-thought than I could chew!!!! 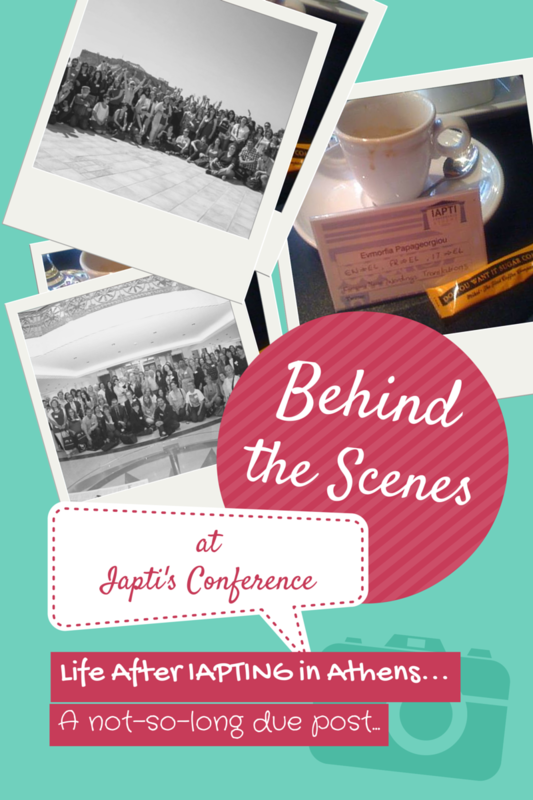 We are so glad IAPTI2014 was such a rich event for you, dear Evi! For me also, meeting colleagues in person is very different than meeting them online! Hope there will be a next time.